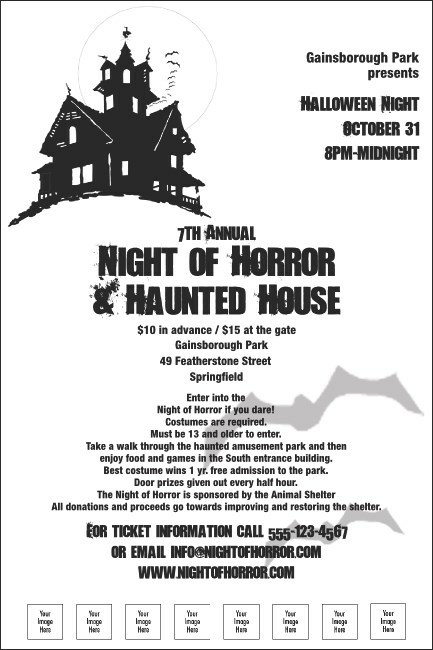 Inject some spooky fun into your Halloween event’s marketing with the Haunted House Poster 002. A deserted mansion swarming with bats sits at the top of this design, while several text lines proclaim celebration details below. Use its eight custom image upload spots to highlight sponsors! Dimensions approximately 11.46" X 17.18"
Promote your event with fang-tastic flair with Halloween-themed posters from TicketPrinting.com.